The Dane Valley Way extends from the Pavilion Gardens in Buxton to the confluence of the River Dane with the River Weaver at Northwich. In 2013 the second half of the route was modified to avoid major roads and extended from its original finish in Middlewich. The extension to Northwich is not currently (2018) shown on OS maps. After the first three miles of climbing the rest of the route is generally downhill. The initial section via Grin Low quickly reaches the source of the River Dane which at over 500m above sea level is the highest traceable river source in the White Peak area. 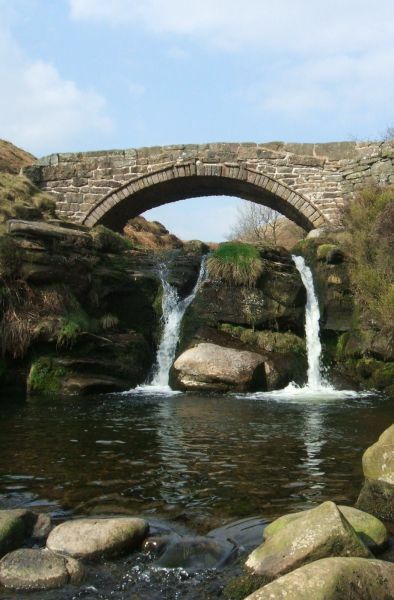 The Dane is the longest, cleanest and possibly fastest flowing river flowing through Cheshire. It can optionally share its outflow between the Irish Sea and the North Sea with the aid of canal feeders. Over the years long reaches of the Upper Dane have provided visitors with relatively open access but, due largely to private land ownership of large hereditary estates, many of the lower reaches of the Dane cannot be readily visited or even seen. The route follows, where possible, the course of the River Dane, passing Three Shires Head, Danebridge, Eaton, Congleton, Holmes Chapel and Middlewich. The second half of the route includes significant road walking. There are links with the Midshires and Staffordshire Ways, the Gritstone Trail, the South Cheshire Way, the Cheshire Ring Canal Walk and Trent and Mersey Canal Walk. The route is described in two leaflets produced by Congleton Group Ramblers.